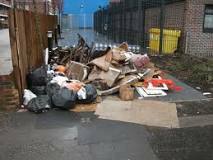 Any Rubbish has been established for over 10 years providing rubbish collection and extreme cleaning services in and around south east London including Office Clearance. 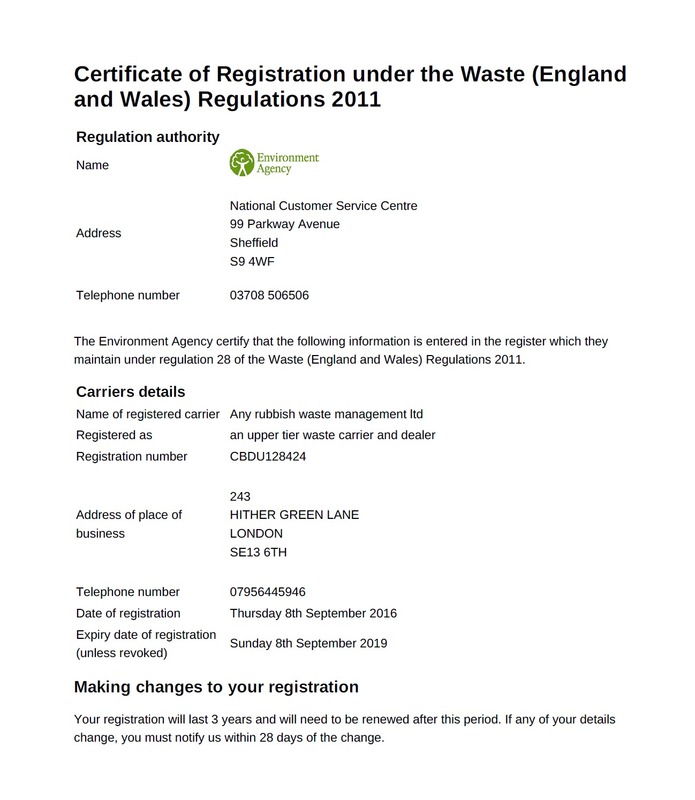 As well as being licensed by the Environmental Agency (a legal requirement of the Pollution Amendment Act 1989), we are fully covered by Public Liability Insurance and hold a currently Criminal Records Bureau certificate for further peace of mind for our customers. We are able to provide a fast, professional and cost effective service to both domestic and commercial customers for any situation where a thorough deeo cleansing is required, including Authorities, Schools, Housing Associations and Health Care Departments. We pride ourselves on being able to cater to each client’s needs and can be very flexible with the services we provide. Our commercial clearance services are available 24 hours, 7 days a week and we offer a free estimate with a same day service wherever possible. No job is too big or small! Special rates can apply for regular customers and contract work, so why not find out more about us and our services. Removal of all furniture, beds and bedding, kitchen appliances, rubbish, carpets, remaining possessions, etc. Generally only fixtures and fittings will be left behind. Clean all floors, sills, ledges, skirting boards, cupboards, etc, to remove dust/dirt/grease/grime/cobwebs and general litter and debris. Areas of walls that are dirty due to grease or grime will be cleaned or the wallpaper removed. Anti-bacterial wash-down to all floors, cleaned walls, windowsills and frames, shelves, skirting boards, ledges, door furnitures and frames, kitchen cupboards and sanitary-ware. Sinks and sanitary fittings will also be treated to remove lime scale and staining. Final sweep up and deodorise. The safe collection and disposal of all drug paraphernalia, including needles, syringes and body fluids. Comprehensive cleaning and anti-bacterial cleasing to protect from infectious diseases such as HIV and Hepatitis. Our extensively trained employees are equipped with necessary protective clothing and equipment. Search for syringes, needles caps and broken needles. Once found, they are removed to sharps bins for incinerations. Painstaking search through all clothing, furniture, beds and bedding, waste bins, accumulated waste, cupboards, etc. Similarly detailed search to all outside areas where presence of sharps is suspected. Inspection of all acceptable ‘void’ areas e.g. behind bath panel, in service ducting, behind broken plasterboards, etc. Visual inspection around sinks and bath traps. Where needles are suspected to be present, or where the traps are blocked, we recommend removal of those traps. Inspection of all structures, carpeted wall/floor junctions, under loose flooring covers, etc. Bird droppings are not only foul smelling and unpleasant to look at, they also carry harmful and corrosive bacteria. If bird droppings are allowed to build up the bacteria can pose serious health risks and begin to corrode buildings. Application of anti-bacterial agent to all areas of fouling and adjacent areas. Bag up all bulk fouling for removal from site to a designated disposal site. Scrape and/or wash down all girders, beams and other surfaces that have been contaminated. Re-application of anti-bacterial agent to all cleaned areas. Spray throughout with residual insecticide. Where necessary, apply deodorising spray. The aim of this service is to leave treated areas in a state of hygiene fit for other workers to follow us if required and to eliminate any residual insect problems associated with the bird fouling. We provide a provide a professional deep cleaning service for commercial kitchens, leaving them germ-free and smelling and looking great. Our cleaning will ensure you can provide a high level of kitchen hygiene, and most importantly, it’ll keep you compliant with the law. By working out of hours, we’ll even do it without any interuption to your business. Structure: Ceilings, Lights, Walls, Floors and Pipework. Extraction Systems: Canopies, filters and ducting. Cooking Equipment: Cookers, Grills, Fryers, Griddles, Steamers, etc. Ancillary Equipment: Tables, Fridges, Sinks, Racks, etc. Servery Areas: Hot cupboards, Bain maries, Display Units and all Serving Counters. All types of bins – wheelie bins, paladin bins, etc. Regular service contracts available – we’ll keep a record of when your bins next need to be cleaned so you don’t need to worry. Rubbish chutes can easily become blocked, and if left undealt with, can become a source of germs and unpleasant smells. Any Rubbish can provide either one-off servicing or a regular contract to ensure chutes and kept in a good, hygienic functioning order. Chute’s cleaned quickly with minimal disruption. As well as the services above, we also do fire and water clear up services.